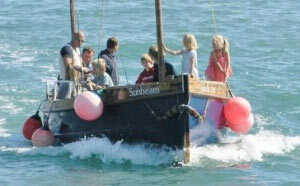 How about going out on a one hour mackerel fishing trip from Lyme Regis with Harry May boat trips? Or you could try a three hour deep sea fishing trip. The mackerel fishing is £9 for adults and £6 for children and the deep sea fishing is £25 pp. All fishing tackle is included and you will be shown just how to catch fish. Please visit Harry May’s Website or phone 07974-753287 for details. SEATON’S new outdoor gym is a free facility and can be found in Seafield Gardens, just up from the Memorial Clock Tower. Axe Cliff Golf Club is a scenic course designed by legendary golf course architect, James Braid. It is one of the oldest courses in Devon having been founded in 1894. Bridport Golf & West Dorset Golf Club is the oldest golf club in Dorset being founded in 1891, its modern facilities and contemporary attitude make it very much part of the 21st Century. Located on the stunning Jurassic coastline, the views stretch across Lyme Bay and along the Chesil Beach to Portland. Our 6213 yard, cliff top links style golf course, is a challenging but fair test for all levels of golfer. Renowned for its friendliness, the Club offers an excellent restaurant, lounge and spikes bar, as well as a Driving Range and Putting Green. Lyme Regis Golf Club (Timber Hill, Lyme Regis, DT7 3HQ; tel: 01297 442963) was founded in 1893 and is recognised as one of the finest golf courses in the South West. The course occupies a cliff top site with coastal views towards Portland Bill and overlooks the historic town and World Heritage Site of Lyme Regis. Green fees: £40, adult; £20, junior (under 16). Special deals available. Sidmouth Golf Club, (Cotmaton Road, Sidmouth, EX10 8SX; tel: 01395 513451;secretary@sidmouthgolfclub.co.uk). Green fees: £30, adult; £13, junior. Special deals available. The Pot Place – try your hand at pottery. Lyme Regis Philpot Museum (Bridge St., Lyme Regis, DT7 3QA; tel: 01297 443370; info@lymeregismuseum.co.uk; walks@lymeregismuseum.co.uk) is a treat for all ages. Adults: £3.95; senior citizens: £3.45; children: free. Open: November- Easter: Wed-Sun 11am-4pm; Easter-November: Mon- Sat 10am-5pm, Sun: 11am-5pm (daily in school holidays). Dinosaurland Fossil Museum (Coombe Street, Lyme Regis,DT7 3PY; tel: 01297 44354; steve@dinosaurland.co.uk). Winter opening hours Sat-Sun 10am-4pm , but may vary. Open daily 10am-5pm from the February half term to the end of the October half term. Adults: £5; children (5 to 16): £4; under 5s: free. Family ticket (2 adults and 2 children): £16.00. The Regent Cinema (Broad Street, Lyme Regis, DT7 3JB; tel: 0871 230 3200; customerservice@scottcinemas.net) is a relic from the 1930s, but does show the latest films. Tables at the back for wine glasses, etc. Very sedate and civilised. Marine Theatre (Church St., Lyme Regis, DT7 3QA; 01297 442138) offers a wide range of productions with the sound of the sea in the background.